Addressing key industry challenges with innovation and focus on customer — RandallAnthony Communications Inc.
At a time when society is INCREASINGLY IMPACTED by changing demographics, rapidly evolving technology, climate change and a competitive environment, the insurance industry is charged with responding to new realities, expectations and risks. 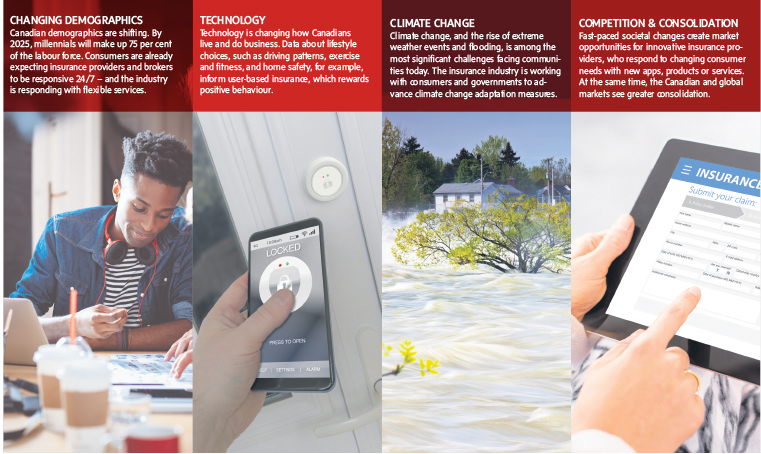 Ms. Coull-Cicchini sees four key trends that are shaping the insurance industry: evolving consumer expectations, technology, climate change and competition. She explains that accessibility and convenience can be enhanced through user-friendly online platforms. An example is Intact Insurance’s Client Centre, a self-service portal that allows customers to access all their insurance information online, including policy details, billing statements, as well as track current claims, says Ms. Coull-Cicchini. “Technology is changing how we live and do business, and one of the most powerful tools emerging today is data,” says Ms. Coull-Cicchini. Many Canadians are willing to exchange their data for value-added products and services. Usage-based insurance programs, for instance, can offer customers discounts on their car insurance based on their driving habits. Climate change presents one of the most significant challenges facing communities and the insurance industry, says Ms. Coull-Cicchini. While Intact Insurance is focused on helping Canadians get back on track after a weather event, Ms. Coull-Cicchini says it’s also taking a proactive approach to help Canadians protect themselves from increases in severe weather, establishing the Intact Centre on Climate Adaptation at the University of Waterloo in 2015 to find new ways to help governments and Canadians adapt to climate change. In an industry where new products and services come online on a regular basis, brokers are uniquely positioned to pair their knowledge of products with an understanding of the customer, says Ms.Coull-Cicchini, who adds that Intact Insurance looks to broker feedback as well as consumer surveys for identifying market opportunities.